I made an ice skates themed meal for my niece on her 11th birthday. She is a figure skater so a skating themed lunch was a natural choice. I had so much fun planning this meal with her and hope that she enjoys it! Happy Birthday Ella! I hope that you have a fantastic year! So cute! I love that you used silver sanding sugar on the blades, so smart! Happy Birthday Ella! 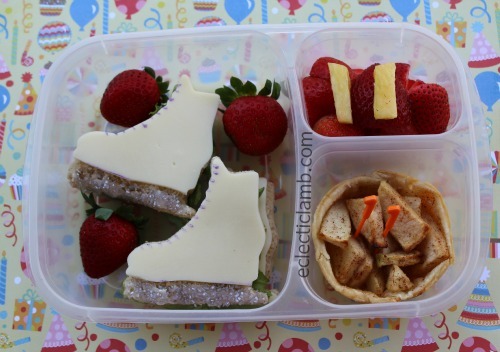 The ice skates are great and it all looks delicious!! Hope Ella has a great birthday! I love the ice skates! Happy Birthday Ella. Happy Birthday Ella! I love that you two connected over bento! Those ice skates are awesome!